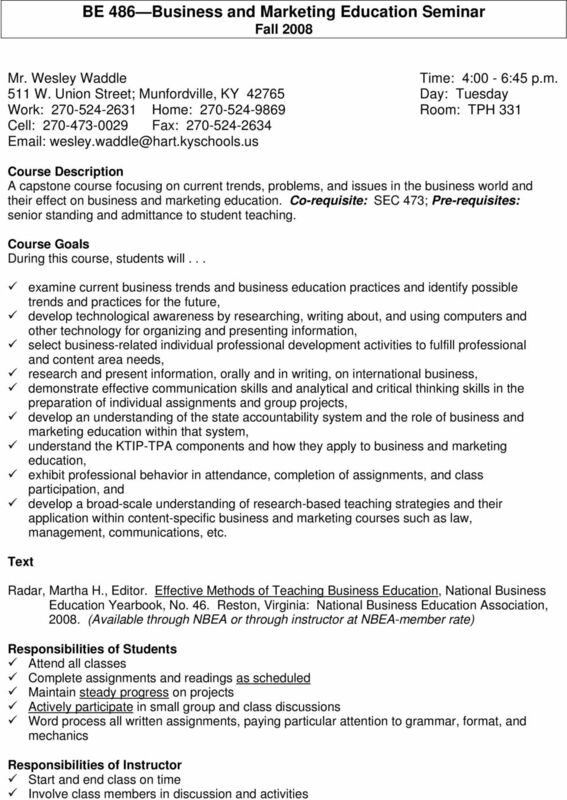 Download "BE 486 Business and Marketing Education Seminar Fall 2008"
2 Fall 08 BE-486 Syllabus 2 Check and return assignments promptly Be available to students for assistance ( is encouraged!) Provide a class setting that is conducive to learning Model strategies and ideas presented in class Provide opportunities for students to apply core concepts in a authentic, meaningful context Attendance Policy Since the development of professional behavior is one of the course goals, attendance is stressed. Please note that points are earned for attendance and participation, and points will be deducted as follows: minus 5 points per absence and minus 2 points per tardy. 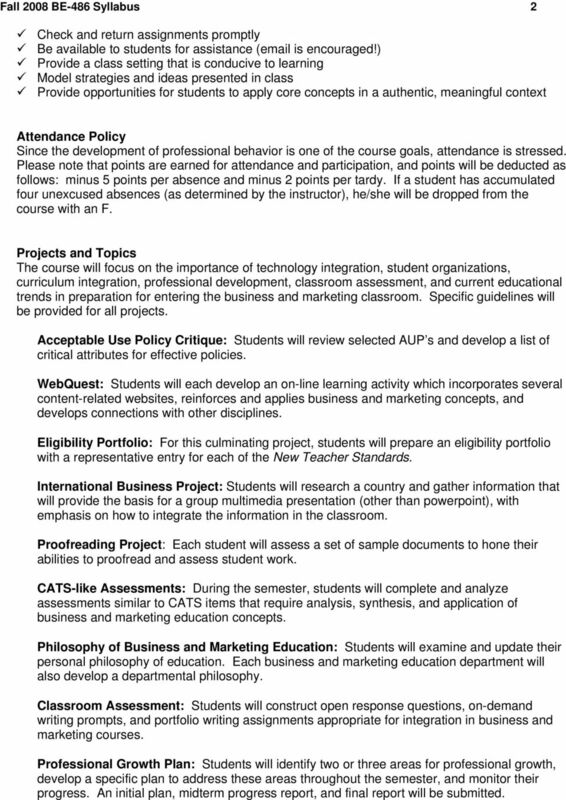 If a student has accumulated four unexcused absences (as determined by the instructor), he/she will be dropped from the course with an F. Projects and Topics The course will focus on the importance of technology integration, student organizations, curriculum integration, professional development, classroom assessment, and current educational trends in preparation for entering the business and marketing classroom. Specific guidelines will be provided for all projects. Acceptable Use Policy Critique: Students will review selected AUP s and develop a list of critical attributes for effective policies. WebQuest: Students will each develop an on-line learning activity which incorporates several content-related websites, reinforces and applies business and marketing concepts, and develops connections with other disciplines. Eligibility Portfolio: For this culminating project, students will prepare an eligibility portfolio with a representative entry for each of the New Teacher Standards. International Business Project: Students will research a country and gather information that will provide the basis for a group multimedia presentation (other than powerpoint), with emphasis on how to integrate the information in the classroom. Proofreading Project: Each student will assess a set of sample documents to hone their abilities to proofread and assess student work. CATS-like Assessments: During the semester, students will complete and analyze assessments similar to CATS items that require analysis, synthesis, and application of business and marketing education concepts. Philosophy of Business and Marketing Education: Students will examine and update their personal philosophy of education. Each business and marketing education department will also develop a departmental philosophy. 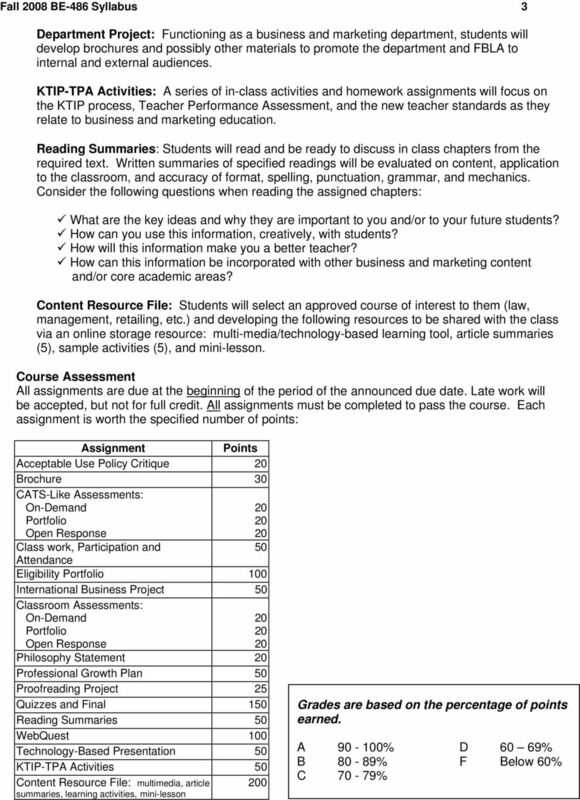 Classroom Assessment: Students will construct open response questions, on-demand writing prompts, and portfolio writing assignments appropriate for integration in business and marketing courses. Professional Growth Plan: Students will identify two or three areas for professional growth, develop a specific plan to address these areas throughout the semester, and monitor their progress. An initial plan, midterm progress report, and final report will be submitted. 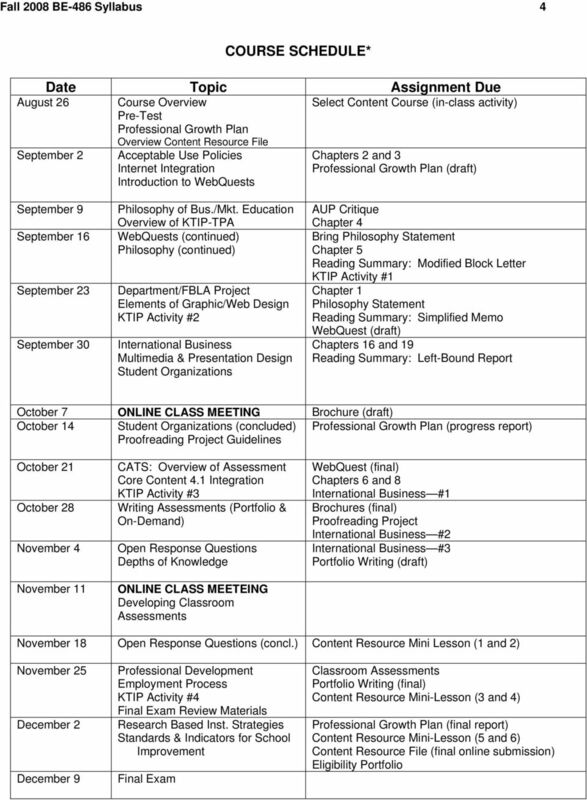 5 Fall 08 BE-486 Syllabus 5 *NOTE: Schedule may change at instructor s discretion with advance notice. AGEC 448 AGRICULTURAL COMMODITY FUTURES AGEC 601 COMMODITY FUTURES & OPTIONS MARKETS SYLLABUS SPRING 2014 SCHEDULE Time: TR, 2:20pm 3:35pm (stacked sections) Location: Heep Center, Rm.103 INSTRUCTOR Dr.
C&I 287 Business Communication Spring Semester 2013 Monday & Wednesday, 9:40-11:00 a.m., ED 112. Moodle Class Support Site: http://umonline.umt. C&I 287 Business Communication Spring Semester 2013 Monday & Wednesday, 9:40-11:00 a.m., ED 112 Sandra Williams, Ed.D. EDU 305 243.4073 Sandra.williams@umontana.edu Office Hours: Mon. & Wed. 11:00 a.m. COURSE SYLLABUS. A. ARE 5359 Teaching Art K-12 Summer A: Mondays/Wednesdays 4:00 8:50 P.M.
GRAPHIC DESIGN 1, ART 2541. Spring Semester, 2014 Washington Hall, 1st Floor, Lab/Room 158 Mondays and Wednesdays, 5:20 p.m. 7:50 p.m. Nursing Education Practicum NURS 5209/6209/7209 4 Credit Hours 16 Contact Hours/week Course Description This practicum experience is designed to integrate theory in a reality context of the teaching role.